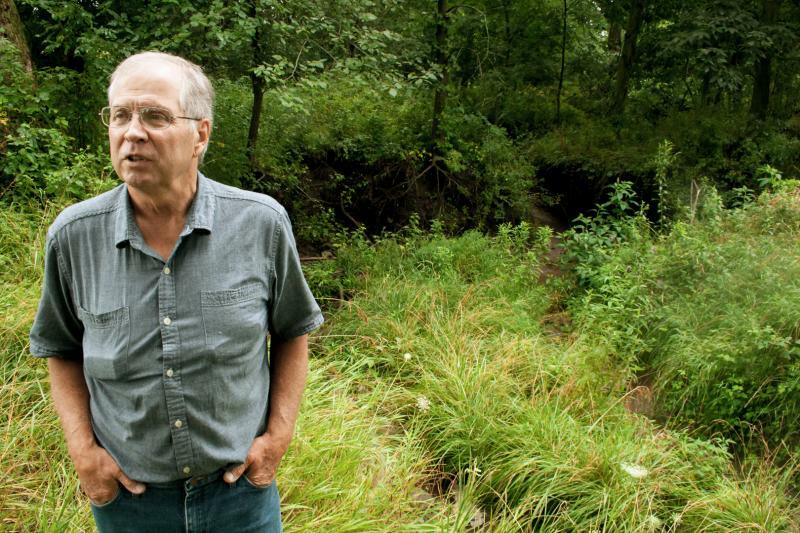 Farmer Tim Smith stands by a creek that cuts through his property near the north central Iowa town of Eagle Grove. He does several water quality conservation practices on his land including a bio-reactor, strip tilling and cover crops. Iowa Secretary of Agriculture and Land Stewardship Bill Northey (left) and Governor Terry Branstad (right) reenact a bill signing in front of a wetland at a farm in Winterset, Iowa, south of Des Moines. Southeast Iowa farmer Garry Klicker stands by a gully on his property near Bloomfield. Most of his 120 acres are in the Conservation Reserve Program or CRP. 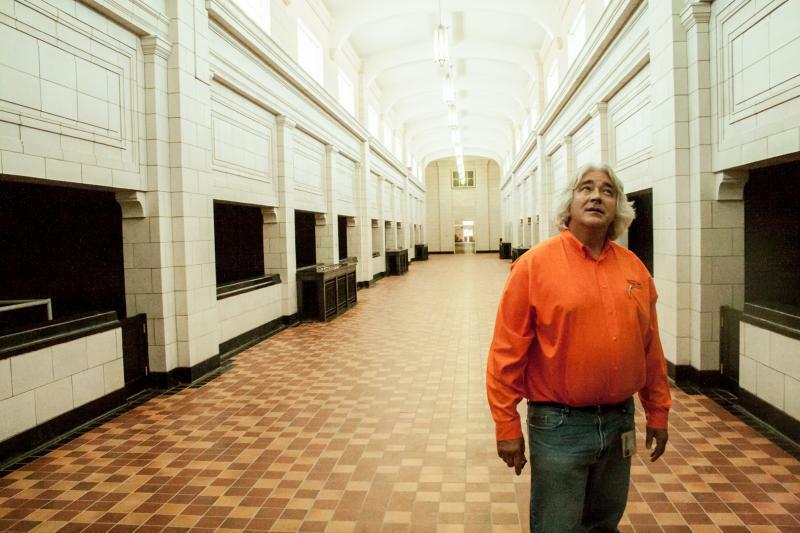 Des Moines Water Works General Manager Bill Stowe stands inside a facility in the Des Moines Water Works Park grounds. 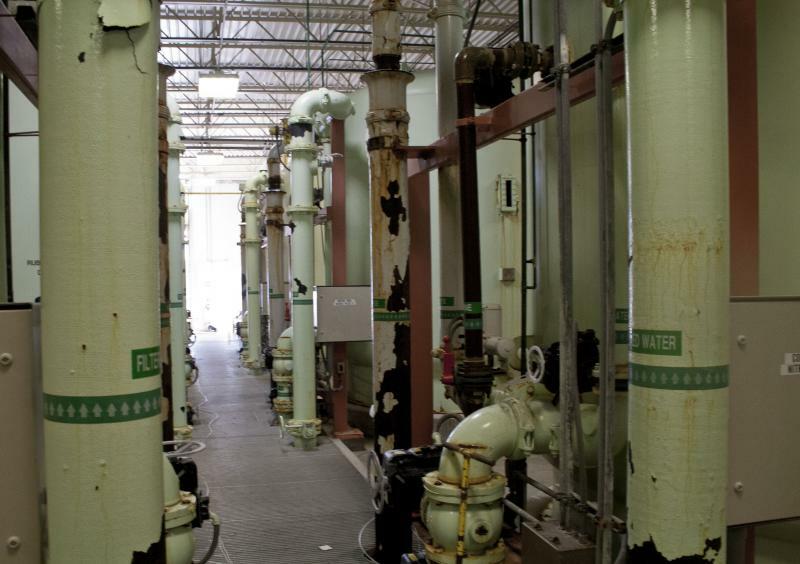 Inside Des Moines Water Works’ denitrification facility. Des Moines Mayor Frank Cownie stands by the Des Moines River in the city's downtown. 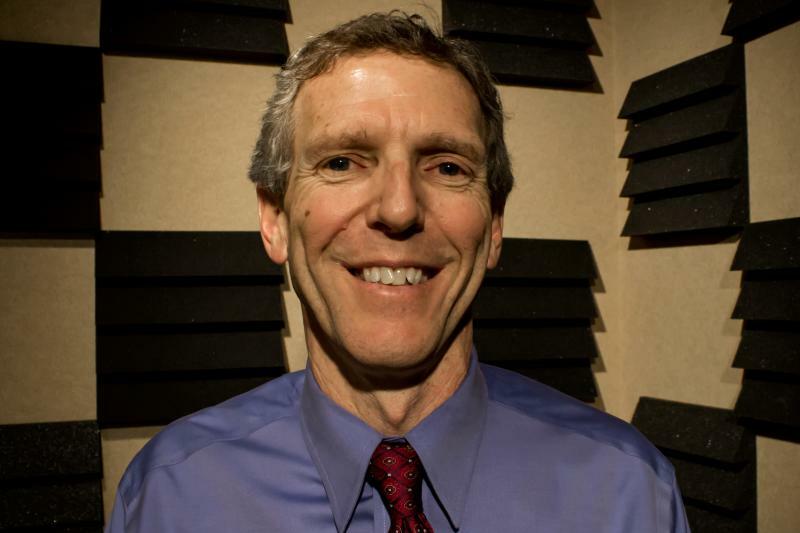 EPA Region 7 Administrator Karl Brooks stops by IPR's Des Moines studios in early 2013. IPR's Clay Masters travels along the Des Moines River and talks with various farmers and policymakers. It’s rolling green hills and patches of thick timber down in southeast Iowa. Part-time farmer Garry Klicker walks through knee high grass to a gully on his land and points out a gully on his land that has deepened because of rainfall. This soil winds up in the Des Moines River, which enters the state in the northwest corner and exits near Klicker's farm. 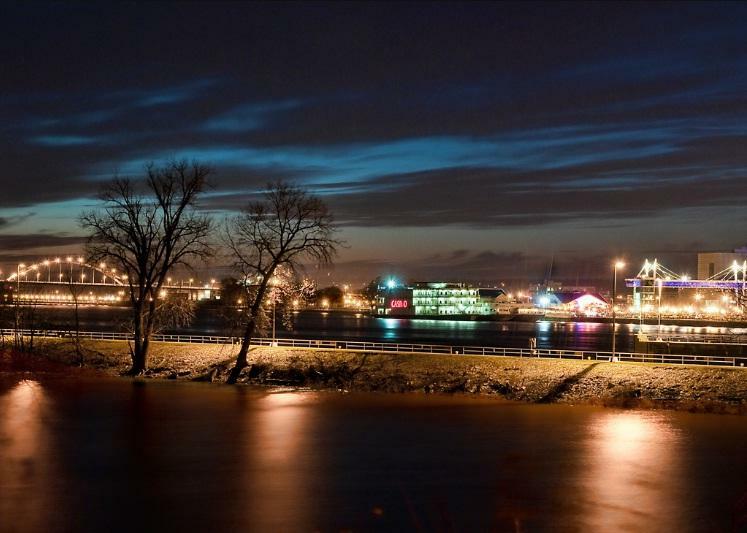 According to the Iowa Department of Agriculture, the Des Moines River carries 23 percent of Iowa’s water runoff. Most of Klicker’s land is in the Conservation Reserve Program – or CRP. He gets paid by the feds to leave his land in grass and keeps the soil on his land. That’s how he’s at least partly addressing the fertilizer and nitrate issue. He says he understands why most farmers rely so heavily on fertilizer. And that has officials in the state’s largest city, Des Moines concerned. 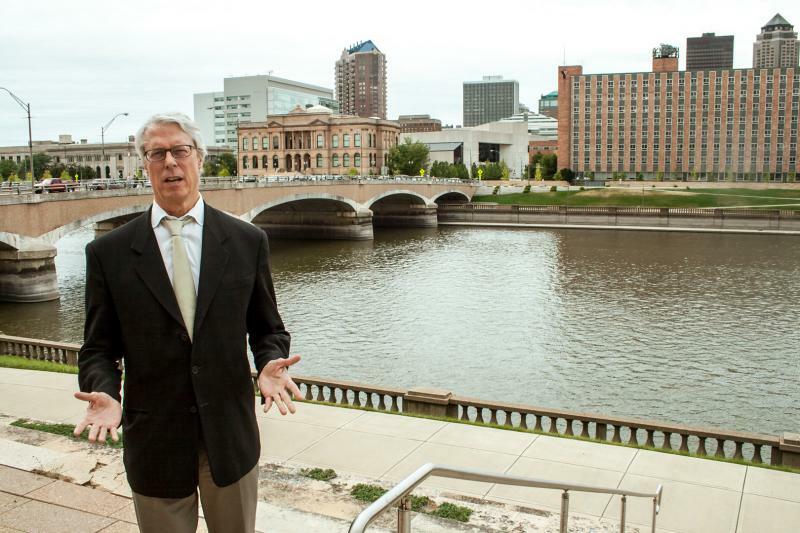 Des Moines’ Democratic Mayor, Frank Cownie, stands by the Des Moines River in the heart of the city’s downtown. The water that passes through the city, eventually ends up in the Gulf of Mexico, helping create a polluted dead zone. Cownie recalled a conversation a few years ago the Mayor of New Orleans. But the nitrate concerns also hit closer to home. 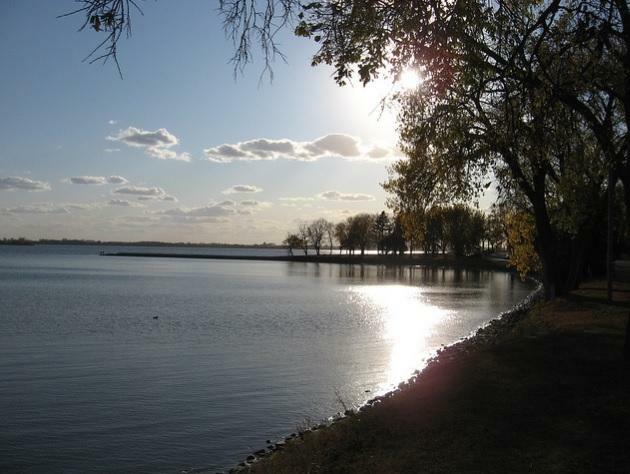 The Des Moines and nearby Raccoon River supply drinking water to the half-million residents of the Des Moines metro. Nitrate levels got so high earlier this summer, that it cost 7,000 dollars a day to remove the nitrates from the water. 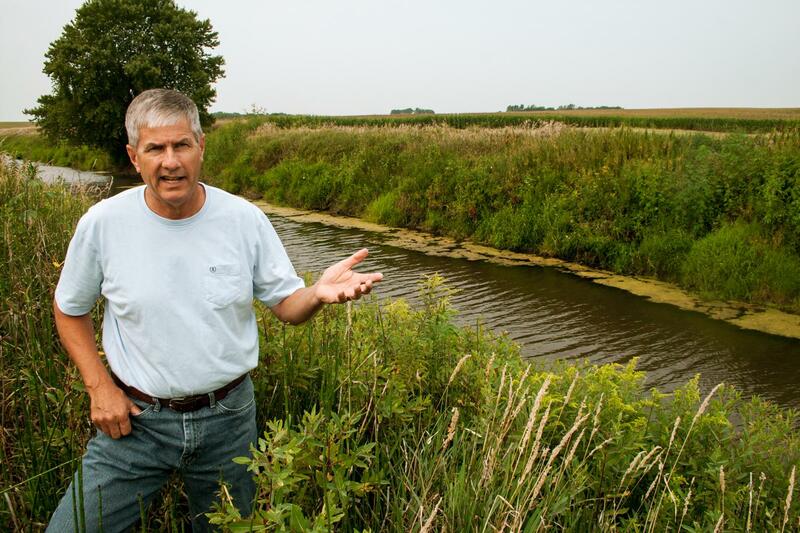 Des Moines Water Works General Manager Bill Stowe says if farmers aren’t held accountable and regulated, the Des Moines Water Works could violate the Clean Water Act. But John Lawrence, Associate Dean of Extension Programs and Outreach at Iowa State University, says they need to start getting farmer buy-in by making it a volunteer basis. Lawrence helped write the plan to reduce nutrient runoff, dubbed the Iowa Nutrient Reduction Strategy. He says the practices and costs in the plan are intended to be attractive to farmers. “If we’re still having this conversation in 5 years, 10 years, whatever, it’s going to be a much more uncomfortable discussion,” Lawrence said. Right now, Iowa Department of Agriculture estimates about 700 new farmers have started doing conservation practices outlined in the Reduction Strategy since its release. USDA estimates there are about 90,000 farms of various sizes in Iowa. The legislature made 22 million dollars over 5 years available to support water quality practices. But farmers are not on the hook – there is no state regulation compelling them to change. But that doesn’t mean farmers aren’t making changes. 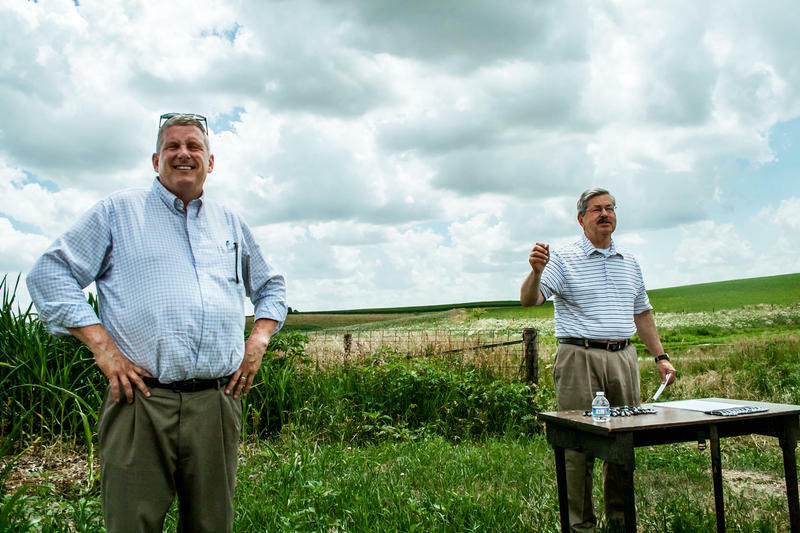 On a hot summer day, Iowa Secretary of Agriculture Bill Northey and Governor Terry Branstad, both Republicans, survey a wetland on a farm near the central Iowa town of Winterset. Water here also flows to the Des Moines River… The runoff from the farm pools in this wetland, the nitrates are reduced by almost 70 percent. Wetlands like this are among the strategies the state is promoting farmers use to reduce nitrates before water leaves the farm. The challenge, Secretary Northey says, is to engage farmers. Secretary Northey helped draft the Nutrient Reduction Strategy. Critics say the strategy was too heavily influenced by industrialized ag-groups. But the Environmental Protection Agency applauds the strategy. Karl Brooks, a regional administrator with the EPA says the agency needs to see year by year how these practices are making a difference. He says if the state isn’t making progress; officials might have to change the program to make adjustments. “It’s entirely possible that the ag producers themselves, once they’re committed into this are going to want to make it succeed,” Brooks said. That’s the case for farmer Tim Smith. He farms more than 800 acres outside of Eagle Grove in north central Iowa; Closer to the Des Moines Rivers’ headwaters. Smith drives his faded old red pickup truck across his land to a creek that cuts through his property. The water eventually flows into the Des Moines River. The farm’s been in his family since the late 1800s. He says he never thought about nitrate levels in the more than 35 years he’s been farming. That is until someone came and tested his water. His nitrates were very high. “That really opened my eyes to what was going on and realizing I was part of the problem even though I was doing what I thought was the best I could,” Smith said. Smith now plants a third crop –a cover crops - he uses rye It holds the nitrates in the fields. Also, instead of plowing the whole field, he just plows strips. It's called strip tilling. That reduces soil erosion. Now, when officials test his water, he’s not embarrassed. His levels have come down significantly. He’s pleased with his results and offers a warning to farmers. Are Iowa Fertilizer Plants at Risk? The deadly explosion at a fertilizer plant in West, Texas is prompting questions about regulatory oversight there. In Iowa, officials say fertilizer is only produced at a handful of sites across the state, but many others store it. A U.S. Environmental Protection Agency spokesman says the agency regulates 700 retail facilities in Iowa that store more than 10,000 pounds of anhydrous ammonia fertilizer, an ingredient that can be particularly volatile. New attention is being focused on the crumbling lock-and-dam system on the Mississippi River. Iowa officials painted a frightening scenario when they appeared before the Mississippi River Commission last week in Dubuque. Clay Masters, Iowa Public Radio. It got pretty shaky there for a bit, as river levels fell dangerously low, slowing down barge traffic essential to exporting Iowa’s grain crops. Mike Peterson with the Army Corps of Engineers in St. Louis says they were able to keep boats moving until mother nature stepped in to make the Mississippi navigable again. "I think it’s a source of relief for a lot of folks in the Corps, the Coast Guard and the river industry." 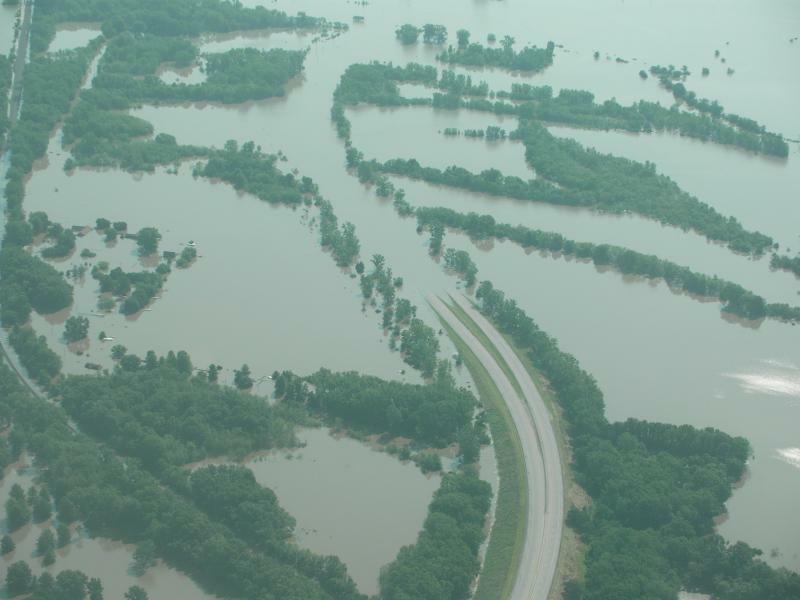 It's been 20 years since the Missouri and Mississippi Rivers flooded, inundating much of the Midwest for months. Host Ben Kieffer looks back on this extensive natural disaster that affected millions of Midwesterns with IPR corespondent Dean Borg, Lester Graham who covered flooding along the Mississippi for NPR, and Bill Stowe who worked for Iowa Power and helped coordinate the isolation of Des Moines's electrical system when the Skunk River flooded the city.